For other uses, see Roses Are Red (disambiguation). "Sugar is sweet" redirects here. For the song by the Party, see Sugar Is Sweet (song). Not to be confused with Sweet Sugar (disambiguation) or Sugar Is Sweeter. 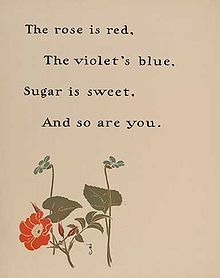 "Roses Are Red" can refer to a specific poem, or a class of poems inspired by that poem. It has a Roud Folk Song Index number of 19798. It is most commonly used as a love poem. Les bleuets sont bleus, j'aime mes amours. And so is maple surple. ^ "Roud Folksong Index S299266 Roses are red, violets are blue". Vaughan Williams Memorial Library. English Folk Dance and Song Society. Retrieved May 20, 2016. ^ The Faerie Queene, Cant. VI. ^ I. Opie and P. Opie, The Oxford Dictionary of Nursery Rhymes (Oxford University Press, 1951, 2nd edn., 1997), p. 375. ^ S. J. Bronner, American Children’s Folklore (August House: 1988), p. 84. ^ "Jill Still Playing Jacks And Hopscotch Endures", retrieved 17 September 2009.